One of the best things about winter is it gives me an excuse to indulge in lazy Sundays. The weather outside is frightful. Everything’s a frozen tundra so it’s not like there’s yard work to do. It’s too cold to open windows, so there’s no indoor painting jobs to tackle. Sure, I could participate in outdoor activities like skiing or something, but who wants to risk a broken leg? Instead, I pursue recreational sports like steaming coffee mug curls and one-handed newspaper reading. Yep, lazy Sundays are the absolute best. Because I have intentionally left my day open, I find Sundays are a great day for leisurely cooking. This is the reason brunch was invented. 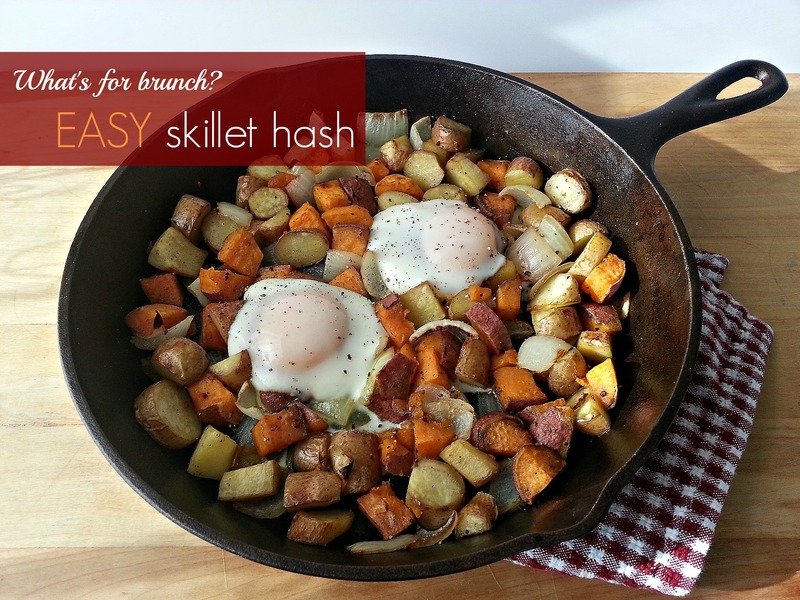 This skillet hash is the best lazy Sunday brunch dish. All you have to do is put everything in an oven-safe dish (a cast iron skillet is best) and let everything get happy in the oven. I find the trickiest part is taking my eyes off my crossword puzzle long enough to watch the eggs when they go under the broiler. And, really, that’s not so bad. I’m back on my couch, under my snuggliest blanket and ready to start a day of television binge watching in no time at all. Place cast iron skillet in oven and heat to 400 degrees. While oven is heating, cut potato, yam and onion into 1″ cubes into a mixing bowl. Add 1 T. of oil and spices to the bowl and mix well. When oven is heated, add remaining 1/2 T. of oil to the pan, coating the surface well. Add potato/yam/onion mixture to the pan. Cook for about 20 minutes, stirring halfway during cooking time, or until potatoes are tender. Remove skillet from oven and turn oven to the broil temperature setting. Crack two eggs on top of potato mixture and return skillet to the oven, placing on the rack directly under the broiler. Cook until the egg whites are cooked and yolk is still runny, or desired level of doneness, about 5 minutes.